Kansas City, MO. 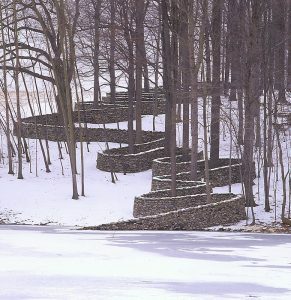 Jan 24, 2019– Acclaimed artist Andy Goldsworthy, who works with nature and time to create site-specific installations, will build Walking Wall in five successive sections at The Nelson-Atkins Museum of Art in Kansas City in 2019. Over a period of five installments, the wall will literally move from the east part of the museum to its final resting place inside and outside the Bloch Building lenses. The stone wall will fulfill Goldsworthy’s long-held vision of creating a wall that inches its way through a place. Walking Wall will move from a five-acre piece of land east of the museum, onto the museum campus, and ultimately into the museum, drawing its way through the museum’s campus. These words have become connected to many of Goldsworthy’s works and specifically to stone walls including one of his largest public installations to date, the iconic Storm King Wall, a 2,278-foot wall that snakes through the Storm King Art Center in New York. 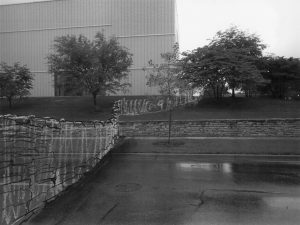 The origin of the proposal for Walking Wall developed from Goldsworthy’s observation of the volume of walls in Kansas City. William Rockhill Nelson is said to have built “miles” of rock walls, and he chose to use native limestone quarried on his property for Oak Hall, the site where the Museum now sits. 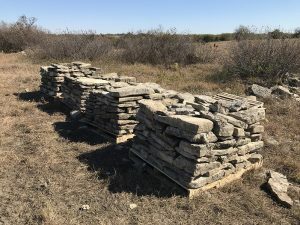 Goldsworthy’s search for suitable stone for building Walking Wall led him to the Flint Hills where there is a history of quarrying limestone as well as the making of drystone walls. He had used Flint Hills Stone for a previous project in Wichita but was not aware of the prairie walls until his recent visit. Initially intending to use freshly quarried stone, Goldsworthy realized that they would look disconnected to the weathered walls around the museum. As a result, Walking Wall will contain a proportion of fresh stone but will mainly consist of weathered material left over from old quarries, old stone picked directly from the field, and old walls that were in the process of being torn down. 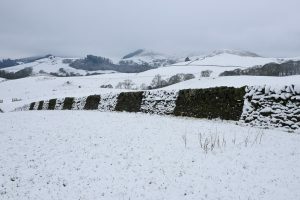 Two Wallers from the United Kingdom (one of whom worked on the Storm King Wall), supported by U.S. assistants, will build the wall under Goldsworthy’s direction. The first section will be made in Spring 2019, and stones within that section will be moved to create the second section, culminating in the fifth and final section that will be complete in Fall 2019. The work will begin on museum property that is just east of the museum. It will cross Rockhill Road and will require the closing of the road for three to four weeks, in cooperation with the Parks and Recreation Department of Kansas City. The public will be allowed to watch the construction of the piece from a distance, allowing the viewer to see boundries cut across rather than created. The installation has been commissioned by the Hall Family Foundation in honor of Estelle and Morton Sosland and their passionate and longstanding commitment to the arts in Kansas City. The Soslands originally commissioned the Shuttlecocks, which have become icons for Kansas City. The four Shuttlecocks, by artists Claes Oldenburg and Coosje Van Bruggen, were installed in the midst of great controversy in 1994. A commissioned piece by Andy Goldsworthy is considered a triumphant addition to the Sculpture Park. Goldsworthy was born in Cheshire, England, in 1956, and is now based in Scotland. Over his diverse career he has become known for creating works in both urban and rural locations using materials at hand – leaves, sticks, stones, even petals and ice. Many of his projects are transient or ephemeral in nature, although he captures the moment with photographs. Other projects are meant to be in place for many years, although Goldsworthy has a continual interest in the changes of time due to nature’s effects or the passing of time. His projects can be found worldwide, from the United States to Australia. Projects include Roof, nine stacked-slate domes in the East Building of the National Gallery of Art in Washington, D.C., Stone Sea, arches of stone at the Saint Louis Art Museum, and Drawn Stone, a commissioned work in the entry courtyard of San Francisco’s De Young Museum, among many others. Goldsworthy is represented by Galerie Lelong & Co. In 2021 a traveling retrospective of his work will open at the Yale Center for British Arts.